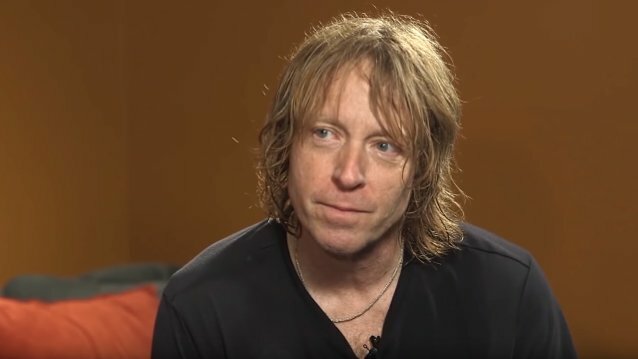 Bassist and producer Jeff Pilson (FOREIGNER, DOKKEN, DIO) recently spoke with Tom Leu of Sound Matters Radio about the just-released self-titled debut album by THE END MACHINE, his new band with his DOKKEN bandmates Mick Brown and George Lynch. (WARRANT and occasional LYNCH MOB vocalist Robert Mason completes the group's lineup.) The full conversation can be streamed below. A few excerpts follow (as transcribed by BLABBERMOUTH.NET). Jeff: "George and I, we'll work at the drop of a hat. We look for excuses to work together... I feel it's very much a band. We're doing three shows coming up in April, which is really exciting. Part of that is because we want to show people, no, this is more than just a project – this is a band. Listen, it has to be limited — I do 120 shows a year with FOREIGNER. Robert does a lot of shows with WARRANT. We're all very, very busy, so it has to be a limited band in a sense, but it's not just a project where we forget about it once it's done. We're very, very committed to it." Jeff: "Just musical adventurism that DOKKEN and LYNCH MOB never really allowed. It wasn't part of the structure of those bands, really. We did it naturally — we didn't try and force it to happen — but George and I, especially musically when we get together, sometimes we go off on adventures. We didn't want to stop ourselves. We knew we wanted to make it a rock record, and we knew we were going to be appealing to DOKKEN and LYNCH MOB fans, so we weren't afraid of that, either... We weren't afraid to be adventurous when it called for it. There are some songs on the record that have some rather interesting musical adventures to them, and we weren't afraid to do that. I loved that." Jeff: "The end solo of that song is so funny. George and I were working on an overdub, and he was playing a guitar you wouldn't normally think of him playing. I have a 1965 Gibson ES-335 that he was playing for a particular overdub, and he just got really inspired. He goes, 'I've got to do the outro solo right now'... It was practically a first take. He was so inspired; he was so on fire. It was amazing to watch. To me, moments like that when he gets to really show his inspired, true, natural self, that's why I do records." Jeff: "He's an amazing frontman. That's why I'm really excited to play live. I just have so much confidence — I know we're going to be great [laughs]... I was really impressed with him on the WARRANT record [2017's 'Louder, Harder, Faster', which Pilson produced]. Mind you, most of the songs were pretty close to written when he came in to work with me, so I had maybe an idea here and there, but I didn't really write on the WARRANT record. I was totally impressed with him in the studio vocally, and I was impressed with his writing. The difference on this record is that he came in with a lot of lyric and certain melodic ideas, but he didn't want to come in with finished ideas. He wanted he and I to kind of carve the finished ideas, which I thought was great. It was more collaborative writing-wise on this, and I think that helped carve a sound that really works for the whole band. The guy is a machine vocally... He's a phenomenal frontman; in the studio, he's really focused; he's a great lyricist; he's a great writer; and he's a great singer. What more could you ask for?" Jeff: "We had another name [SUPER STROKE], and we soon abandoned that. George came up with the name THE END. We all liked that a lot — we thought, 'Oh, that's a cool band name.' Then we did a trademark search and there was 463 people that had 'The End' trademarked. That was the end of THE END. What was interesting is THE END sounds very dark, and our record isn't particularly dark. There's kind of a positive quality about it, so we liked that. I don't know remember who added the word 'machine' to it, but somewhere along the lines, the word 'machine' got added. But we wanted to emphasize 'the end' — that's why the logo stresses 'the end,' and then 'machine' is in smaller letters. It just seemed to represent what we wanted to do, which is, maybe we're at the end — maybe things have gotten really bad — but maybe there's such a thing as a happy ending. That's kind of what the goal of the record was to be, and the message of the record. I think that holds up, and it just kind of says what we wanted it to say." Jeff: "I often think to myself, 'I wish now was the time when people were buying millions of the records that I make,' because I feel like I make better records now than I did in the day when they did... George and I are better than ever, and Robert... he should be a star right now. He should be a big, big rock star. He really should. That's a shame to me, but we're doing this because we love it. We're not making a fortune on this stuff. If it can lead to more things, great. It starts with the passion, and that's when you get the best music." Jeff: "We do have a name for it, and it's a great name, but we're not going to say the name until we make a formal announcement. What a great project that's turned out to be. The record is in the can. It's been recorded, [but] it hasn't been mixed yet. That's going to happen soon with our dear friend Alessandro del Vecchio in Italy. He's so great. The music is done; the songs are done; the tracking is done. It came out fantastic. I could not be more excited about it. It's very melodic, and Robin sounds amazing. He really gets a chance to show you what he can do on this record. The writing and his singing are just phenomenal. It's very melodic, but it's gutsy. Robin's voice has got power for days. He just delivered like you would not believe. Everybody did. Matt came in and played the crap out of this stuff. His drumming added a lot of fire and energy to these tracks. We're really happy with it." Jeff: "I love FOREIGNER. I love being in FOREIGNER. If I have a disappointment about FOREIGNER, it's that we don't get to record more. I wish we did, because when we do, I so enjoy it. Every moment I spend with Mick Jones in the studio, I treasure like gold. He is a legend. He truly has a brilliance about him that is fairly unmatched in the industry, so I value all those moments and I would love to have more of them... I think the thing I've learned the most from Mick is his absolute persistence and dedication for what he perceives as the right thing. Sometimes the right thing for him isn't necessarily perfect — it's just right. He's got a flawless instinct about that. He won't give up until he gets there, and that's a real lesson to learn... I take that principle very seriously — do it until it's right, whatever it takes. Sometimes that requires extreme persistence, and learning how to deal with people in the process in order to bring that out of them when it's not happening. That's a tricky thing." Jeff: "I know that Don [Dokken] and I both feel that we still have one great record in us, and I would love some day to do that great record. I just don't know when we'd have the chance time-wise, because it would be involved and it would be a commitment, and I just don't have that kind of time because of FOREIGNER... I do sincerely hope some day we get to do that one, final, great DOKKEN record." 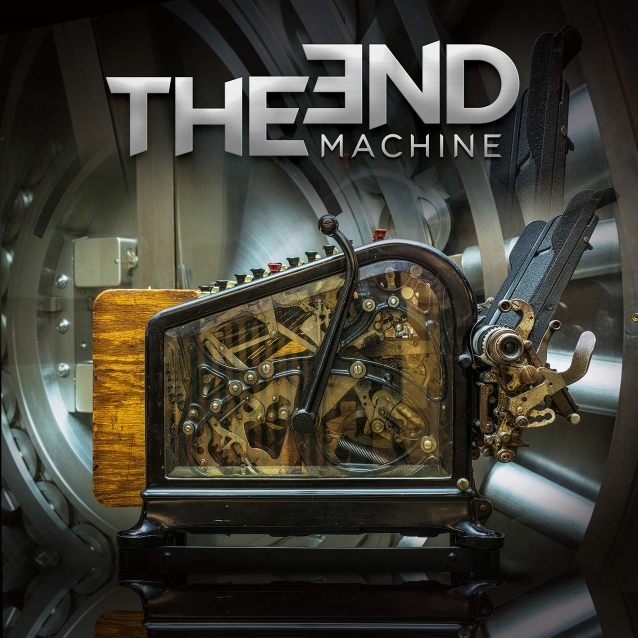 THE END MACHINE's self-titled, Pilson-produced debut album was released on March 22 via Frontiers Music Srl. The group will play its first set of shows in April, albeit without drummer Brown, who is unable to make the dates and will be temporarily replaced by EVANESCENCE's Will Hunt. Listen to "077: Jeff Pilson from Foreigner, Dokken, & The End Machine" on Spreaker.